The relationship among data, information and knowledge is often depicted as a pyramid. With data at the base, it’s converted to information and information converted to knowledge. This metaphor of a pyramid or ladder to explain these concepts is unhelpful because you start to believe one is better than the other and there is a tendency to extrapolate to the next level believing that knowledge is simply extrapolated to form wisdom—I have even heard people talk about wisdom management. My two days at the meaning making symposium has helped me see this relationship differently, that is, viewing data, information and knowledge as a system. 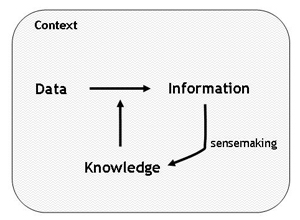 Thanks to John Barton at the symposium reminding me of a view of data, information and knowledge first brought to my attention by Dave Snowden which I will extend to include the role of sensemaking and context. Knowledge acts as an interpretant to turn data into information. The information we notice (we don’t notice all information channelled toward us), might create some level of dissonance (its surprises us or we ask ourselves, “What’s the story here?”) and if we care about resolving this dissonance we create knowledge. Knowledge is created through a sensemaking process. But data to one person is someone else’s information. A commodities trader might stare at a computer screen of numbers which would look to most people as raw data. To the commodity trader, however, slight changes in the numbers conveys messages which act as information they might convert to knowledge (via sensemaking) and take action. Consequently, context is a key ingredient acting as an underlay to all three concepts of data, information and knowledge. Thanks for reposting this Shawn, I missed it the first time round. I would make your system loop go back further: data is a knowledge based construct – ie we abstract a model and components for how we want to manipulate information before we can create data. This is based on knowledge and awareness of likely knowledge and information needs. Good idea Patrick. How would you picture it? Hi Paul, Greg’s model doesn’t come directly to mind. Is it on the web somewhere so I can take a look? Thanks Shawn – love the diagram. I’ve been quoting Snowden for a while now, but now I have your picture to go with it!